Hands-Free Telephone Headsets & Earpieces: Communicate Clearly and Comfortably. Below you will find a wide range of commercial grade call center telephone headsets at attractive prices on individual purchases. If you need 50 telephone headsets or more, we will provide a custom quote upon request. 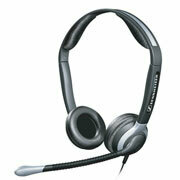 These call center headsets specifically work with traditional telephones (not cell phones). In addition to the headsets, we offer complete support including assistance by phone and email in choosing the right headset, finding the correct accessories, and getting your headsets repaired. Note: All Sennheiser telephone headsets feature a proprietary quick disconnect fitting and all require an additional cable to connect to your specific telephone. For the correct connecting cable, see the Sennheiser Headset Selector. Check out our Sennheiser Telephone Headset Accessories Page for all the accessories you need to complete and/or repair your Sennheiser telephone headsets, including connecting cables, interface boxes, amplifiers, computer connections, replacement ear pads and headband parts and optional accessories for a variety of Sennheiser telephone headset products. Let us know if you need anything not listed, or if you need help choosing the right product. All the accessories you need to complete and/or repair your Sennheiser telephone headsets. Includes connecting cables, interface boxes, amplifiers, computer connections, replacement ear pads and headband parts and optional accessories for a variety of Sennheiser telephone headset products.